At Hughes and Salvidge we recognise our statutory duty to comply with all Health and Safety legislation and continually strive to achieve the highest standards in all matters relating to the health, safety and welfare of our employees and anybody else who is affected by our activities. Our health and safety performance is acknowledged as one of the best in the demolition industry – this is reflected in our outstanding health and safety record. 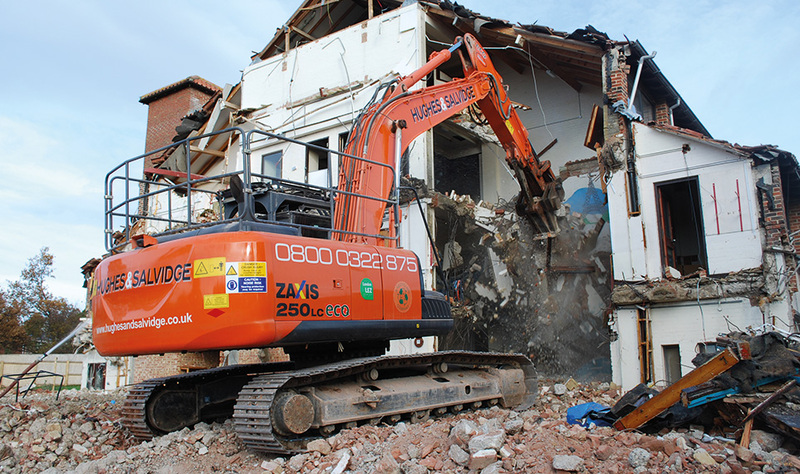 Hughes and Salvidge carry out all demolition works to BS6187:2011 and all our work complies with applicable legislation, Guidance Notes, Acts, British Standards, Approved Codes of Practice including the CDM Regulations and the National Federation of Demolition Contractors (NFDC) regulations. We have implemented an Integrated Management System that addresses all elements of Health, Safety, Quality and Environmental Management. This system is audited by a UKAS approved audit organisation and is to BS EN ISO 9001, 14001 &18001 standards. By following a structured management system, our clients have the comfort of knowing that they are dealing with a robust organisation. We promote best practice across all areas of our business and operations and continually review our procedures. Regular discussions reveal any areas for improvement including new and emerging customer needs. Should improvements be identified, these are integrated into our processes and systems to ensure continual business development and to enable us to remain at the forefront of our industry. Hughes and Salvidge employ a full time Safety, Health, Environment and Quality (SHEQ) Manager to ensure competent advice is readily available on all our projects. Our SHEQ Manager is NEBOSH qualified as well as a Chartered Member of the Institute of Safety and Health (IOSH). He has specialist knowledge of Health and Safety with a track record of successfully implementing procedural management systems to ISO 9001, 14001 and 18001 certification. He also has practical experience of asbestos removal, dismantling, demolition and remediation projects allowing the development of comprehensive project specific Risk Assessments, Method Statements and CDM documentation. We place particular emphasis on training and keeping our techniques and working practices completely up to date. All operatives hold relevant CSCS and CCDO cards. These systems and training levels ensure the upmost safety levels on site and stringent compliance to regulations on site at all times. Our commitment and achievements in relation to health and safety have been recognised through numerous industry awards and accreditations.